Khularam “Dev ” Thing is one of our lead guides and has been working in the trekking field since the age of 17. He first started as a porter, carrying heavy loads to every destination of Nepal during all seasons. Because of his industrious nature, English skills and wonderful rapport with clients, Dev quickly moved into a guide position. He has experience on all main trekking routes and at the highest altitude levels of Nepal and the Tibetan Himalayas. Dev is also very active in his community, organizing the re-building of his local school and homes in the Langtang Region after the earthquake of 2015. He truly has a heart for doing good and a warm personality to match. Because of his experience and superb organizational skills, Dev is well- regarded in the trekking industry and excels with large groups. He is extremely organized and adept at handling any situation that may arise and is an invaluable member of the Hope Treks team. 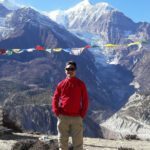 Dev is certified by the Trekking Guide Association of Nepal, has completed High Altitude Risk and Leadership Training, and earned his trekking Guide license from the Nepal Academy of Tourism and Hotel Management. He is also certified in First Aid. When he is not trekking, Dev splits his time between Kathmandu and Kalcche with his wife and 2 sons. Adhish Rai is one of our lead guides. 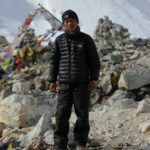 He grew up in the shadow of Mount Everest, in a Kulung village called Chheskam, developing a strong connection to the mountains at a young age. He began working as a porter on school vacations at the age of 14 and after graduating from high school, quickly moved into work as an assistant guide, porter/guide and then lead guide. He is well known all over the Everest region, celebrated for his quick smile and competent, courteous nature. You can read more about him in this article. All of the porters we hire come from Adhish’s village – he knows all of the best ones! They are honest and energetic and work together like a family – we are incredibly fortunate to have each of them on our team. 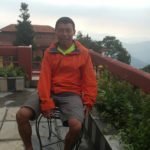 Adhish earned his Trekking Guide license from NATHM and the Nepal Department of Tourism. Adhish’s English skills and engaging personality serve him very well in the tourist industry and make him a favorite on the trail. He is also currently pursuing a certificate in English. He splits his time between Kathmandu and the village of Chheskam. Tonya Dreher is the owner/operator of Hope Treks and has a passion for travel that began in childhood. As a young adult, she traveled to the Caribbean, throughout Europe several times, and visited the Middle East. She also lived, worked and studied for extended periods in Wales, UK and Poland. Tonya worked as an English teacher, had a photography business and eventually had three children in her home, New Hampshire, USA. Her travel slowed down with the arrival of the kids, and even more so when her youngest son was diagnosed with a progressive and terminal illness. She and her husband started the Hope for Gus Foundation in 2010 to raise money for medical research for Duchenne muscular dystrophy. Then in 2014, Tonya began to ask herself if she could continue these local fundraisers forever? She also wondered, “Am I doing ENOUGH to raise money and awareness for this deadly disease?” She wanted to do something really BIG…and soon found herself googling “highest mountain in the world” and Everest to End Duchenne was born! This inaugural fundraising event took place in October of 2015 and the trek quickly became a metaphor – the team was climbing to base camp of the world’s highest mountain for these kids who were LOSING the ability to walk. Everest to End Duchenne was successful on a number of levels and a short documentary was produced about the trek, while plans were made for the second ETED. Meanwhile, Tonya could not shake the irresistible bond she felt with the country of Nepal and the incredible people she had met there. 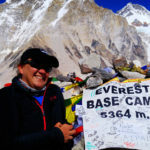 She returned two more times in the next year, making connections and working with her guides on ways to help their poor, earthquake-torn towns and underfunded villages schools….and also getting some more treks under her belt! It was obvious to her that her new friends, guides and porters in the trekking industry, were seldom able to find work and often underpaid for their hard, honest work. After months of soul searching and researching, HOPE TREKS emerged as a solution…a different kind of trekking company that funds medical research for Duchenne, pays a fair and living wage to its employees, and offers clients the trek of a lifetime at an affordable price! amazing! In addition to his expertise with traditional Nepali food, he has perfected many favorite western dishes, such as homemade pizza, pastas, and omelets. His skills have also led him to work in the various regions of the Annapurnas. Birta has begun to work as an assistant guide in the last few years and is currently taking English classes to improve his communication with clients. He has a delightful sense of humor and provides great comic relief on the trail! He lives in Kathmandu with his wife and four beautiful children.